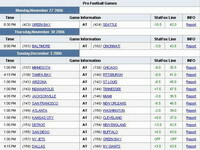 Software: BetUS Sportsbook utilizes ASI software with their own proprietary front end graphics interface. 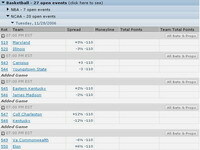 ASI software is used by many of the top sportsbooks in the industry (MyBookie, Betcom, BetJamaica, Skybook, WagerWeb and Cascade). The software layout is clean and functions well. I experienced no lag whatsoever and most betting screens updated quickly. Site navigation was easy with well thought out screens and clean graphics. The site contains an abundance of information including news, radio, BetUS girls, video, etc... Sometimes the amount of information can be overwhelming which made for a few cluttered screens. 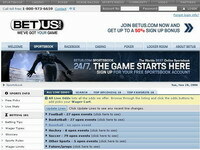 BetUS offers an extensive help menu system that will aid the user through most issues that the user may have. 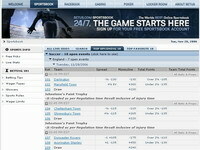 Wager Limits: Internet: minimum $5, maximum $5,000; Telephone: minimum $100; maximum $100,000. Support: Very good around the clock live assistance, international toll free telephone numbers and e-mail support. The toll-free number took about one minute before being answered. Support staff was very knowledgeable and was able to answer all of my questions over the telephone without any problems whatsoever. The support staff had a Spanish accent (thus indicating that they are probably from their Costa Rican office). The representative with whom I spoke to was very pleasant and seemed to enjoy her job. E-mail responses took approximately one hour.